NFL Slant And Go: Are The Patriots Heading Into A Letdown Spot In Chicago? We’re closing in on the halfway point of the NFL season, a scary proposition for our lives and having to go outside on Sundays. We’ve got 10 games on the daily fantasy NFL main slate thanks to an early morning matchup in London and I’m going to do my best to help lead you through the rest of the options as we try to find some sweet success for ourselves here in Week 7. And as is always the case, promo code SLANTANDGO will get you one week free on all of our NFL packages here at Awesemo.com. Join now to get Awesemo’s rankings and premium articles, projections, and the ownership percentages that are THE most important part of daily fantasy sports when constructing your lineups. If you want to win like a pro it helps a lot to invest in the data the pros use. Sign up now and improve your game. You can tweet me @ChrisSpags with questions and things and please do tune into On The Contrary with me, Awesemo, and Rotoworld’s football genius Evan Silva on Saturday at 1:30 Eastern or the Live Before Lock with me and Josh Engleman on Sunday before kickoff. I’ve had some solid football takes this year so join me on the Awesemo YouTube channel to talk more about all the things I see in my mind-numbing hours of research each week. And now let’s get to the games. The Texans get a Jacksonville team in desperate need of a wakeup call after two hideous road performances for their defense that was so historically good last year; any team who doesn’t take a cold hard look in the mirror after getting carved up by Dak Prescott needs to fix their priorities. And I’m counting on some home cooking being the thing to guide these Jaguars back to glory against a quarterback in Deshaun Watson who’s sacked more than anyone else on the slate. There’s a chance the Texans and Watson have seen enough of a plan of attack from the Cowboys and Chiefs to move the ball versus Jacksonville and I’m not terribly inspired by the complete lack of turnovers or pass deflections the Jags are generating. If you’re less confident in some Jags regression to the mean, looking at Will Fuller and Keke Coutee in low-owned stacks with Watson would likely be a smart thing to consider. Fuller’s targets have really taken a hit with the emergence of Coutee but at some point it has to level out; the hope is Fuller’s hamstring getting healthier somehow leads to him breaking a game open and if there were a game that could use gamebreaking vintage Will Fuller plays, this is it. I tend to think this game won’t be very high scoring and Vegas implying the same makes me feel a little less bullish on Blake Bortles and co. But Houston has given up passing TDs on 6.2% of opponent drop backs, a very generous rate, along with a 66.7% completion rate and wouldn’t it just be the Bortlesiest thing ever to see him go nuts after his flaws have been so massively highlighted for two straight weeks? In a max multi entry situation, I’ll have some of Bortles and his targets, likely Dede Westbrook or Keelan Cole though Donte Moncrief should see some more involvement after a zero-catch day versus Dallas. TJ Yeldon remains a solid play too with Leonard Fournette still out of practice and he does seem to always go a bit overlooked despite his involvement in the run, pass, and red zone attack. Tampa Bay will trot out a new defensive coordinator with linebackers coach Mark Duffner taking over the much maligned group after the firing of Mike Smith. And while that may lead to quick fix boost in a matchup with a rookie QB who’s turning it over, getting sacked, and not completing passes at a good rate, I’m more inclined to think this game has some shootout potential. Duffner has not been a D.C. since 2002 for the Bengals and a lot has changed in 16 years. Cleveland offensive coordinator Todd Haley versus a guy taking over the worst unit in the league does not seem like an equitable matchup, even a little. I don’t love Baker’s price given how meh he’s been but his targets are interesting with Landry picking up 10.5 targets a game, Antonio Callaway still in the mix with his hideous 38.5% catch rate, and David Njoku, my favorite of the group he’s become a highly targeted option with the athleticism to break any play. Ownership on Njoku will be key since if he comes in too highly owned, it may be time to jump over to Landry or even the increasing workload of Duke Johnson. Overall though, I’m very open to this offense in the matchup even if I may mute exposure a bit out of fear that the message of the coaching change is enough to spike one viable week out of the Tampa Bay D (which does make them an interesting low-owned flyer versus the very rookieish Mayfield). Cleveland is a weird team defensively because they’re giving up a ton of yards with 406.5 allowed to opponents per game but also limiting QB completion rates to 58.4% and forcing turnovers at a higher than average rate en route to holding teams to a very solid 28.6% scoring rate. It’s hard to imagine Jameis Winston not throwing it all over them though and I like Mike Evans after he disappointed a ton of folks wildly last week. DeSean Jackson can still get open downfield better than most and he and Jameis looked like a decent connection versus the Falcons. OJ Howard and Cameron Brate are also always in play as potential shots to pick up two TDs. I would also not sleep on Peyton Barber after his very low-owned emergent performance last week; Barber hasn’t been great so far this year but the run game has been one area the Browns have faltered and Barber is at a stellar price if he gets any sort of workload similar to his 17 touches in Atlanta. Minnesota’s coming off another wobbly performance versus Arizona where they came away with a win but didn’t assert themselves like you’d think they may at home. And I do think this game has some sneaky shootout potential based on what we’ve seen so far from both teams. The Jets D has done a good job limiting scores but Kirk Cousins and his 43 pass attempts a game should find gaps in coverage, particularly given how they aren’t generating much pressure up front with a 5.4% sack rate. Cousins and Adam Thielen have been one of the most potent duos around this year but I think Stefon Diggs may be an interesting leverage spot after a down week. Kyle Rudolph has also been quiet recently and with the Jets offering a strong 22% boost to tight ends according to Football Outsiders’ DVOA, it’s certainly possible he gets back on the board in a more meaningful way. The Jets have quietly been doing their thing in two straight home wins and I think they’ll be game for this matchup versus the Vikings. Sam Darnold has been practicing after banging up his elbow in Week 6 and should be good to go, which is good news for the emergent Jermaine Kearse who stepped in and was as good or better than Quincy Enunwa in his role after Enunwa exited with an injury. The Vikings have given up a lot of deep balls and a pretty high 8.1 yards per pass so Robby Anderson should also be a consideration. Anderson had a quiet week after being a Millionaire Maker winning low-owned flyer in Week 5 and he could easily get back on track with more targets to go around and just a couple of bombs from Darnold. The Vikings have been atrocious at covering running backs according to DVOA and Bilal Powell’s activity in the pass game could be useful if they try to get him going. It still tends to be a crap shoot as to whether he or Isaiah Crowell are more viable and you could play either guy without any argument from me. Chris Herndon got on the board with his first TD of the year and he’s an interesting very cheap TE option given the Vikings being the worst team in the NFL vs tight ends according to DVOA. They give up a 47% boost to the position and it’s really just a matter of Herndon getting the looks needed to easily hit value. Can you imagine being a wide receiver on a floundering team and just being like “Nah” when your rookie QB wants to build rapport with you before a game? And isn’t that like the one thing you have to do as a wide receiver before a game? It’s unreal. But maybe he respects Derek Anderson enough to be useful versus a Colts team giving up 387 yards per game, a 73% completion rate, and scores on 47.1% of opponent drives. You can also talk me into Zay Jones, Charles Clay, and LeSean McCoy here because I think there’s something decent that is very likely to go unowned here. The Colts get a less friendly matchup versus a Bills team that’s really gotten after teams after a few bad games to start the year. The Bills are only giving up 311 yards per game but with Andrew Luck averaging 48 mostly dink and dunk attempts so far, it may not matter much. Chester Rogers has been his most targeted receiver with TY Hilton out while Eric Ebron has been solid with the targets he’s received with Jack Doyle sidelined. Marlon Mack asserted himself in the backfield with a big game on 12 carries and he may seize some of Nyheim Hines’ passing game role if he flashes more skill there. I’m not sure I’d want to play him in this matchup but I loved Mack coming into the year so it wouldn’t surprise me to see him assert himself if he’s healthy and they get him the ball. I think there are a couple ways you could stack this game with both sides and possibly get some under the radar upside. 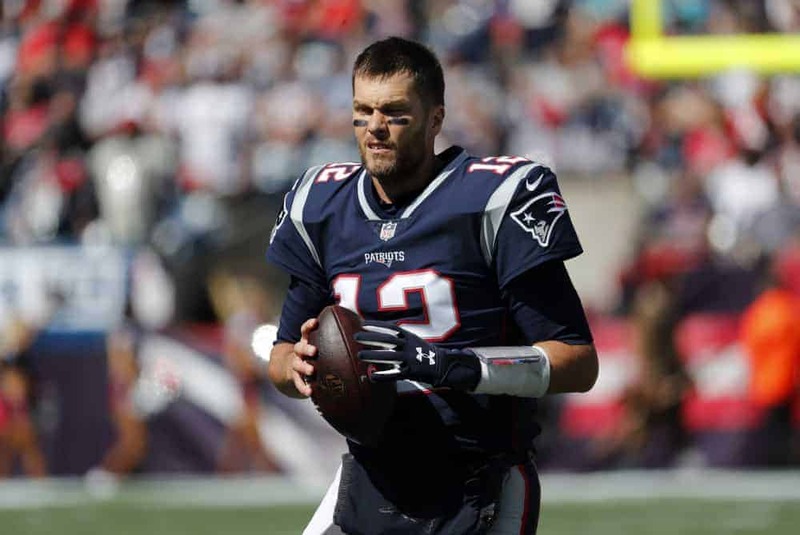 New England is riding high after pretty much out-game-managing the Chiefs at home in an explosive matchup and here we’ll find what seems to be the perfect letdown spot for the Patriots. The Bears looked beatable versus Brock Osweiler of all people so naturally going to Tom Brady here would be a logical move. The Bears have forced turnovers and generated sacks but they still give up a ton of passing TDs with a 6.1% rate and they also have allowed QBs to throw it fairly deep with 8.9 air yards per target. Maybe this is the Josh Gordon breakout spot? I like that idea. You could also see a ton of targets for Julian Edelman or James White, the latter of whom is interesting with a pretty high price coming off a down game. I’m deeply afraid of the letdown against a Bears squad who should come out motivated after that embarrassment in Miami but these are the Patriots so you’ve got to trust that process some too. I have to imagine that provides a little chip on Mack’s shoulder assuming he does end up active after missing practice with an ankle injury. The Bears in general won’t be lacking for motivation either and they’ll get a matchup with a New England team who’s generated the worst sack rate on the slate and allowed 379.3 yards per game along with a 6.4% passing TD rate. Taylor Gabriel and Tarik Cohen have been the primary vessels for the Bears offense and they’ll undoubtedly pick up a little more popularity this week but both remain good plays even if the offense flows elsewhere. Allen Robinson has been hampered by a groin injury but this does seem like a spot where he may assert himself after his targets have come down a bit the last few weeks. Jordan Howard has also stunk out loud and didn’t do much to get back on track thanks to Miami sticking it to the Bears but his price has finally taken a turn downward. Don’t be surprised when I float a Howard/Bears D stack on On The Contrary this Saturday with Awesemo and Evan Silva on the Awesemo YouTube channel. Matt Stafford and the Lions are coming off a bye for a matchup with the confusing Dolphins and if last week is any indication, there’s a real chance this game becomes a bit of a wild one too. Miami’s defense has given up a ton of yards per game and 7.8 yards per pass while not creating much pressure, an interesting spot for Stafford to get things done. Stafford paired with Tate, Golladay, or Jones will have some interest to me, likely in that order. It wouldn’t surprise me to see more involvement for Kerryon Johnson after some time for the Lions to really think about it with their bye week, though he and LeGarrette Blount were neck and neck and neck for touches during the Lions’ last game. The passing game is the real interesting part here but I wouldn’t blind myself to the running game. Brock Osweiler hardly threw the ball to great success in Week 6 versus the Bears and I’ve got to assume the Lions getting that on film has to help them a little. That said, this is a pretty bad Lions team who’s allowed teams to throw deep on them while also allowing teams to gash them on the ground to the tune of 5.3 yards per rush. Detroit has also allowed score on 44% of opponents’ drives and passing TDs on 6.6% of opponent attempts. Point being: Brocktober may continue for one more week. Albert Wilson has been the Tyreek Hill of this offense, scoring touchdowns in a variety of ways despite not a ton of volume. It feels like that has to regress a little but I do think he’s now a player you really need a couple of flyers on just to be safe. Kenny Stills has had a quiet few weeks but this is really a team he can beat downfield so I’ll have some interest in him with his price down. Danny Amendola’s targets were way up with Brock at QB and 8 targets in this matchup could pay a lot of dividends. It hurts but this whole passing attack seems intriguing. Kenyan Drake let the team down with a crucial fumble last week but both he and the ageless Frank Gore seem like interesting options given the fact they should both see a bunch of touches versus this porous Lions run D. Miami is a baffling team but at home you can convince me to use them in a variety of ways and I wouldn’t mind it one bit. The Panthers did not look good in their loss on the road at Washington last week and a matchup versus the Eagles isn’t likely to be much more hospitable. Cam Newton does tend to play well in tightly competitive matchups as the primary vessel for everything in this offense and I think he’s an option here, as is Christian McCaffrey despite a down week (where he still got 8 targets and 8 carries). Devin Funchess looked solid as a #1 receiver but I do kind of like the idea of Torrey Smith getting it going versus the Eagles in a revenge-y spot after looking solid last week. They’re not really targeting Torrey downfield as much as he has been in the past with his 13.4 air yards per target right in line with DJ Moore and Funchess but with more attention likely devoted to Funchess, Smith may have some use. Greg Olsen returned to the lineup in Week 6 getting 7 targets and that certainly could pay more dividends this time, though the Eagles are the best in the league against tight ends according to DVOA. The Panthers have allowed people to throw deep against them and it’s not impossible that stirs up the best in Carson Wentz, a player who threw downfield more than anyone last year but is currently averaging just 7.7 intended air yards per attempt after his return from knee injury. Corey Clement looked good on a “pitch count” in Week 6 and he deserves a larger share of the role in a matchup versus a Carolina team who gives up decent production on the ground. Alshon Jeffery has looked like his elite self since returning from an early season injury and his ability to find the end zone with 9.7 targets per game should always make him a consideration at his current price point. Nelson Agholor’s target share has continued to recede while Jeffery and Zach Ertz remain the main beneficiaries of Wentz’s throw and I see no reason that would change this week, though it’s worth noting the Panthers have been far better defending WR1s as opposed to WR2s according to DVOA. So the real question here is: Does defense matter…in this particular matchup? And my answer is a “Yes, but.” Namely because I think that Brees sees less yardage than he usually does (definitely less than he did versus the punchless Redskins before the Saints’ bye) but I still wouldn’t be surprised to see a fair amount of scoring. The Saints defense is porously bad and the Ravens pass attack isn’t as bad as people may think based upon recent years of Joe Flacco. I would not game stack the Saints because of my concerns over yardage not being quite as plentiful but playing a Michael Thomas, Ted Ginn or a priced down Alvin Kamara or still-cheap Mark Ingram alone does make a lot of sense to me. And maybe a Benjamin Watson revenge game? Probably not but at $3,000 on DraftKings it’s worth a dart toss. The Ravens get a matchup versus a Saints team who’s allowed opponents to throw all over them and I think that plays right into Joe Flacco’s hands. I would be open to a Flacco stack with John Brown or Michael Crabtree and Willie Snead at his price is interesting going against his former team. Brown in particular should be able to beat them deep. The Saints have also given up a ton of rushing TDs and that could be a spot for Buck Allen or Alex Collins to squeeze some value despite the Saints generally holding rushers to a bottom of the league 3.1 yards per attempt (this could be a symptom of the pass game being so readily available, though). Overall I think the Ravens will come out looking to strike versus New Orleans and from there it’ll all be about what Brees can and can’t get going versus a Ravens D that’s looked as good as any thus far this year even without generating the turnovers they did in 2017. Dallas is coming off a baffling performance in which they threw all over the Jaguars’ vaunted pass defense despite looking completely futile through the air thus far and as a Cowboys fan I’ve got no faith they keep that rolling. But as a person who analyzes sports for a living, I’m intrigued by them getting a matchup versus a Redskins team who hasn’t been gashed by the pass game for the most part but who’s 6.1% pass deflection rate is the worst on the slate. Pass deflection rate can be an indicator of future success for a secondary with the logic being that if you’re near a ball enough to deflect it, you’re generally doing more to disrupt a receiver with coverage. And if you’re not there it may because of a coverage scheme designed to keep passes in front of you, something the Redskins have tried to do with moderate success outside of New Orleans this year. The Vegas total leads me to think the Cowboys pass game comes back down to Earth and that seems like a nice time to buy into Ezekiel Elliott. He’s been matchup proof, including his 100 yards last week versus Jacksonville, and he’ll go against a Redskins team giving up the most rushing TDs on the slate. I love the matchup for him and anticipate having a good amount of ownership on him. The Cowboys are another team who mostly keeps passes in front of them while allowing a 70.4% completion rate and that could be a benefit for a QB with an allergy to throwing deep like Alex Smith. Chris Thompson returning from injury would be a big help for Smith but he proved last week he can generate just enough points to pull out a win. Jordan Reed was highly targeted in Week 6 despite mediocre results and he could give the Cowboys a death by a thousand cuts en route to a couple TDs this week. Besides that it’s sort of hard to trust this offense given the dearth of yards created by Smith. Adrian Peterson seems sneaky to me too as a result, particularly given his proven record of spitefulness and the ongoing flirtation he and the Cowboys have had for years. Nothing here worth banking on but there could be something okay to roll out at low ownership. The Rams will be without Cooper Kupp after he sustained a leg injury in Week 6 and that should offer some clarity here in a matchup where the Rams seem likely to put up a ton of points with the highest total on the slate. The target concentration tightening between Robert Woods and Brandin Cooks with Kupp out would be a huge asset to those guys in a package with Jared Goff. Todd Gurley also came down a bit in price after another monster performance versus Denver and you could credibly play him with the core of the pass attack without much concern. Josh Reynolds should see more run as a result of Kupp’s absence and he’s been a decent play who’s been targeted deeper downfield than Cooks and Woods so far this season. The ownership will likely be here heavily but there are a lot of ways to go that should find success versus the porous Niners D.
The 49ers have been feisty to their credit and CJ Beathard put it all on the line in Monday’s tight loss to the Packers. The Rams D hasn’t been as good as advertised since losing Aqib Talib and they just allowed Case Keenum to get going versus them so maybe this is a spot where Beathard and his targets could get going. Marquise Goodwin in particular should get some looks after a monster game versus the Packers where they used Goodwin to his fullest capabilities as a burner. George Kittle was quiet in Green Bay and he’s been limited in practice with a knee injury. If he were at full health I think he’d be an interesting Goodwin pivot and he will still be for me in small doses. Trent Taylor has returned to practice and he could be a sneaky play after 7 catches for 61 yards on 8 targets and a TD versus Arizona in his last healthy game. Matt Breida looked solid despite a few nagging injuries and despite the short week I don’t mind him versus a Rams D who gives up 4.8 yards per rush. Raheem Mostert seemingly seized the #2 back role away from Alfred Morris, although coach Kyle Shanahan said it wasn’t “permanent” so he may not be worth having on your radar yet outside of Showdown single-game slates. There we go, ten more games broken down exactly as they’ll occur I’m sure. Follow me @ChrisSpags, tune into On the Contrary and Live Before Lock this weekend, and I’ll see you guys next week with more written words about NFL things.